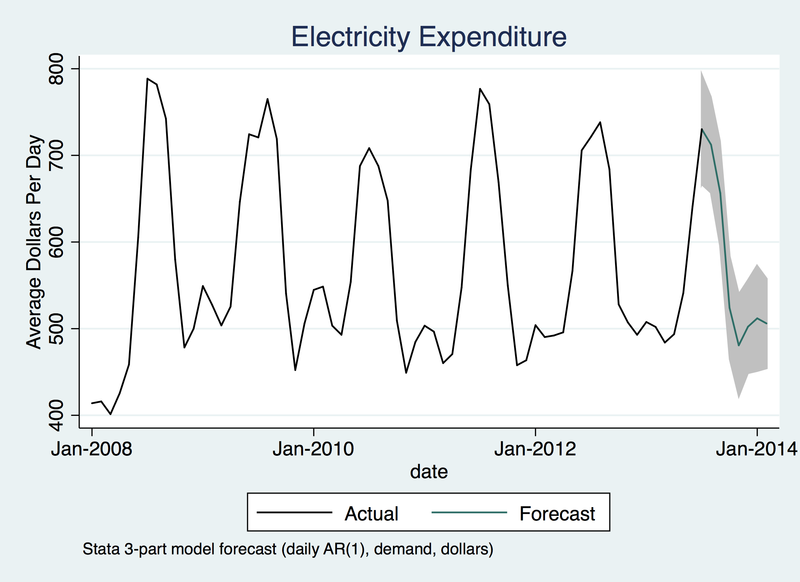 One of the great new features in Stata 13 is a command called forecast. This is not just another version of predict, it’s more like a forecast system management/dependency tool. You can take one or more regressions and deterministic equations and forecast takes your exogenous variables, pulls their values from your data set, feeds them into the equations/regressions that use them, take the resulting endogenous variables and feeds them into the equations/regressions that use them, chaining together a whole multi-part forecast. It also has tools for testing alternative scenarios, for inserting shocks and other modifications of endogenous variables, and for calculating confidence intervals of the system via simulation. As an example, I have another series of postings where I analyzed the electricity usage and expenditures for a high-rise condo complex. (Here, I’ll gloss over details of variables and interactions, but you can find out more in the original series.) In order to forecast, my exogenous variables must all be available as forecasts somewhere, and since a major driver of electricity usage is temperature, that’s what my model is based on. To keep things simple, I originally modeled expenditures as a single hierarchical regression with exogenous variables: a month’s average temperature and a high/low-season indicator. This works out reasonably well, and you can read more about it in the other series. sureg (daily temp#c.dca55) (demand temp#c. (dca55 L.daily)) if daily < . reg dollars rate#c. (daily demand) if daily < . Where I combined daily and demand into a seemingly-unrelated regression (SUR) because in the best case the calculations would benefit from daily and demand experiencing similar shocks and thus having correlated error terms. In the worst case, I wouldn’t gain anything over doing two separate regress‘s. This may seem straightforward, but Stata has actually done several things that make this much more powerful than two separate regressions. Remember that the regressions mentioned five variables — daily, demand, temp, dca55, and dollars — of which we designated two exogenous, leaving the other three as endogenous. In calculating the forecast, Stata read values of the exogenous variables from the data set, as necessary at each time step, but ignored any values of endogenous variables. The endogenous variables were instead forecast by the regressions. which will do the forecast and also calculate SD’s of the forecasted variables via 100 simulations. You can obviously try out different scenarios by providing different values for the exogenous variables. But you can also override predictions of endogenous variables in a couple of ways. One way is to use the actuals option, which will override predictions of endogenous variables whenever their values are are not missing (.) in the data set. You can also use forecast adjust to conditionally modify endogenous forecasts, adding shocks or other manipulations to see how they propagate through the system. It’s very impressive, really. The only downside is that only about half of Stata’s regression commands can be used with forecast, though this includes the biggies like OLS, GLM, ARIMA, ARCH, GARCH, VAR, VEC, IV regression, SUR, and non-linear regression. The graph at the top of this posting shows my forecast for the next eight months, based on NOAA’s long-term temperature forecast for the area. Hey, great post! For in-sample forecasting the Stata option for the predict command is stdp which calculates the standard error. However, to calculate out of sample we are using forecast solve and the statistic option is standard deviation instead. Do you have any insight on why the change? Thanks so much for sharing Wayne (sorry for the delay, I only just got around to redoing this! ).